The Durban University of Technology’s (DUT’s) glossy alumni publication, DUTConnect, clinched the bronze award for Printed: External Magazines and Newsletters during the annual Marketing, Advancement and Communication in Education (MACE) Excellence Awards held on 29 November 2018 at Nitida Wine Farm in Cape Town. The MACE Excellence Awards takes place annually as part of the MACE Congress and it recognises and celebrates excellence and the achievements of specialists and practitioners in marketing, advancement and communication in the higher-education sector. Ngubane said they are always trying to introduce new innovations to improve the publication and he believes that such improvements impressed adjudicators who were evaluating their entry. “In the past, the focus was mainly on featuring alumni in the world of work and their amazing achievements, which we still do. But we are now incorporating other elements such as what the DUT community is doing and its contribution to the sector,” said Ngubane. “The magazine issue that we submitted for these awards for instance also featured two articles on topical issue written by our very own DUT experts. One of them was on listeriosis written by Dr Ngxongo (Head of the Nursing Department) and the other was on the water crisis written by the award-winning Prof Faizal Bux who heads up the DUT Institute for Water and Wastewater Technology. I think this may have contributed towards impressing the judges,” he added. Ngubane added that this award has inspired them to push for the ultimate prize, which is the gold award, and to achieve that he said they will introduce a new strategic approach to the publication. “There are a few strategies we will employ going forward but one of them is that we are now going to identify key themes that are of local, national or international importance that are relevant to the higher education sector in some way and then develop that particular magazine issue around the central theme,” he said. “We also want to use the magazine to celebrate, not only our alumni, but our University and its staff and students through addressing and highlighting important relevant issues. Our latest spring issue for instance, focused on entrepreneurship and what role DUT is playing in promoting and supporting entrepreneurship among students in particular. I believe that this approach will widen the appeal of the magazine and make it more valuable to read without isolating or neglecting our existing readers. The magazine should also be part of an integrated system of effective communication with our various stakeholders as DUT, so we will be working more closely with Corporate Affairs in this regard,” explained Ngubane. MACE fulfils a leadership role in the higher education, TVET, and private education sectors within Southern Africa by adding value to practitioners in marketing, advancement and communication through high-quality development programmes, facilitating networking partnerships and transformation, as well as promoting best practices among these professions at its member institutions. 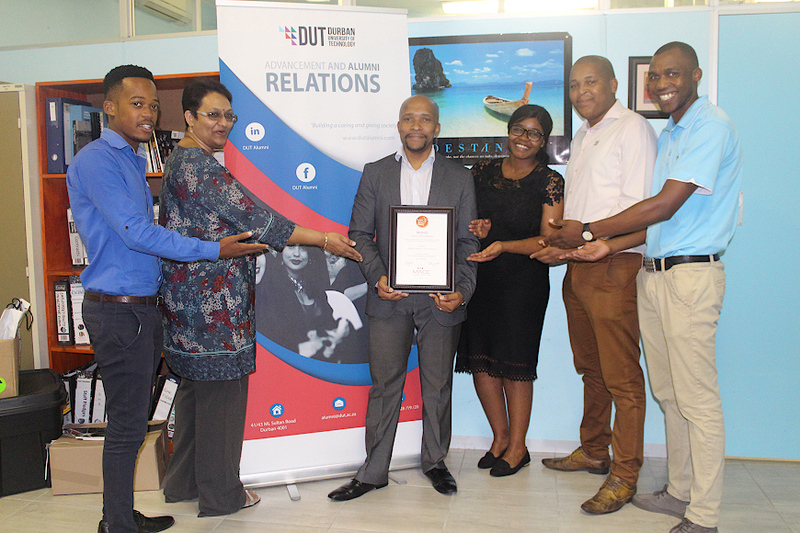 Pictured: DUT Advancement and Alumni Relations, Director, Zwakele Ngubane with his team.